The Eminent Persons Group (EPG) is a body made up of highly regarded individuals who act as an esteemed advisory body to, and on behalf of, the Commonwealth that was re-established in 2009. The EPG’s aim is to ‘undertake an examination of options for reform in order to bring the Commonwealth’s many institutions into a stronger and more effective framework of co-operation and partnership’. The EPG’s mandate to advise on potential reform within the Commonwealth was most recently undertaken at CHOGM 2011 in Perth, Australia with its report ‘A Commonwealth of the People: Time for Urgent Reform’. The report reflected a desire to re-establish the Commonwealth’s identity in order to make the Commonwealth relevant in the context of current affairs, with particular attention on human, political and civil rights; development; trade and investment; and environmental issues. 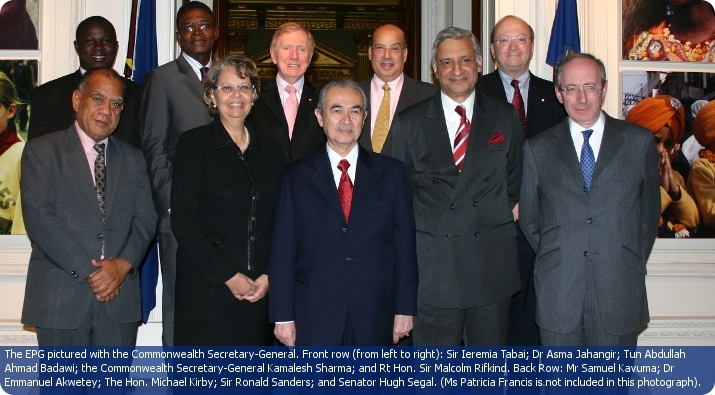 The EPG comprises Tun Abdullah Ahmad Badawi (Malaysia/Chairperson), and Dr Emmanuel Akwetey (Ghana), Ms Patricia Francis (Jamaica), Dr Asma Jahangir (Pakistan), Mr Samuel Kavuma (Uganda/Commonwealth Youth Caucus), The Hon Michael Kirby (Australia), Rt Hon. Sir Malcolm Rifkind (UK), Sir Ronald Sanders (Guyana), Senator Hugh Segal (Canada), Sir Ieremia Tabai (Kiribati). Tun Abdullah Ahmad Badawi is a former Prime Minister of Malaysia and minister of education, defence, foreign affairs, home affairs, finance and deputy prime minister. He succeeded Mahathir Mohamad as Prime Minister in 2003, building a progressive and modern multi-racial society as well promoting wide-range reform. He was a member of the Commonwealth Ministerial Action Group and an architect of the Commonwealth Youth Programme. Dr. Emmanuel O. Akwetey is the founding Executive Director of the Institute of Democratic Governance (IDEG) in Ghana. He is an advocate of democratic governance and human development. He has been consulted by the Government of Ghana, the African Capacity Building Foundation (ACBF), the Government of Liberia, UNDP and several bilateral donor agencies. Ms. Patricia R. Francis is the Executive Director of the International Trade Centre in Geneva. She previously served as President of Jamaica Trade and Invest, where she served as President since 1995. She served twice as President of the World Association of Investment Promotion Agencies and chaired the Organisation of Economic Co-operation and Development’s Caribbean Rim Investment Initiative as well as the China Caribbean Business Council. Dr. Asma Jilani Jahangir is a prominent human rights advocate from Pakistan. She was Chairperson of the Human Rights Commission of Pakistan and President of the Supreme Court Bar Association of Pakistan. At the United Nations, she serves as Special Rapporteur on Extra-judicial, summary or arbitrary execution and as Special Rapporteur on freedom of religion or belief. Mr. Samuel Kavuma is the interim Chairperson of the Commonwealth Youth Caucus. He has been a student leader in Uganda since 1997. In 2004, he was elected to the National Youth Council of Uganda and in 2007 he was elected to be the Regional Youth Caucus representative and he has helped pioneer the establishment of the one-stop youth centre by UN-Habitat. The Hon. Michael Kirby AC CMG was a Justice of the High Court of Australia (1996–2009). He was President of the International Commission of Jurists (1995–1998) and in 2010 was named co-winner of the Gruber Justice Prize. Sir Malcolm Rifkind KCMG QC served as a Minister in the United Kingdom government from 1979–1997, first as Secretary of State for Defence then as Foreign Secretary. He is currently a Member of Parliament and is Chair of the Intelligence and Security Committee which has oversight of the UK’s Intelligence Agencies. Sir Ronald Sanders KCMG is an International Consultant, Writer, and former Caribbean diplomat who has served on Commonwealth advisory Committees and as a trade negotiator. He has held senior positions in the private and public sectors including as a member of the Executive Board of UNESCO. He has written extensively on small states. Senator Hugh Segal CM was appointed to the Canadian Senate in 2005 and has served as Chair of the Senate Foreign Affairs Committee and is currently Chair of the Anti-Terrorism Committee. He served as Chief of Staff to the Prime Minister of Canada, Associate Cabinet Secretary (Ontario) for Federal-Provincial Affairs and Policies and Priorities, Legislative Assistant to the Leader of the Opposition (Ottawa). He was President of the independent Institute for Research on Public Policy. Sir Ieremia Tabai is currently a Member of Parliament of the Republic of Kiribati. He was the country’s first President from 1979 to 1991 when he stepped down as required by law after serving the maximum of three terms or twelve years as Head of Government. Sir Ieremia was educated in both Kiribati and New Zealand. He spent three years at St Andrews College in Christchurch before going to Victoria University in Wellington where he did a degree in commerce. The EPG group has also existed before in such an advisory role from 1985-86, as a means to kick-start dialogue and negations in relation to the apartheid regime in South Africa. Its remit was ‘to examine the situation in South Africa, to determine the way forward, and within that to look at the possibilities of dialogue, of the dismantling of apartheid and of sanctions.’ Whilst there is debate as to the extent of their success, revisionists are now seeing the EPG as playing a major role in forming the constitution of a re-born South Africa. Co-chairman: Malcolm Fraser, Australia. Prime Minister of Australia 1975–83. Founding chairman of CARE, humanitarian aid organisation fighting global poverty with special emphasis on empowering women. Co-chairman: General Olusegun Obasanjo, Nigeria. A career soldier before serving twice as head of state, once as military ruler. Held in prison by General Sani Abacha 1995–98. Lord Barber of Wentbridge, UK. Chancellor of the Exchequer under Edward Heath. Chairman of Standard Chartered Bank until 1987. Dame Nita Barrow, Barbados. Governor-General of Barbados from 1990 until she died in 1995. During EPG mission she entered restricted Alexandra township disguised in African garb. John Malecela, Tanzania. Prime Minister of Tanzania 1990-94. Representative to the UN 1964–66. High Commissioner to UK 1989–90. Sardar Swaran Singh, India. Foreign minister of India from 1964–66 and again in 1970-74. Singh is also his country’s longest serving cabinet minister. Archbishop Ted Scott, Canada. Primate of the Anglican Church of Canada 1971-86.